Penny Parker is a teen-aged sleuth and amateur reporter with an uncanny knack for uncovering and solving unusual, sometimes bizarre mysteries. The only daughter of widower Anthony Parker, publisher of the "Riverview Star," Penny has been raised to be self-sufficient, outspoken, innovative, and extraordinarily tenacious. Her cheerful, chatty manner belies a shrewd and keenly observant mind. Penny was the creation of Mildred A. Wirt, who was also the author of the original Nancy Drew series (under the pseudonym Carolyn Keene). Wirt became frustrated when she was pushed to "tone down" Nancy Drew and make her less independent and daring. With Penny Parker, Wirt had a freer hand and received full credit. Wirt once said, " 'I always thought Penny Parker was a better Nancy Drew than Nancy is." 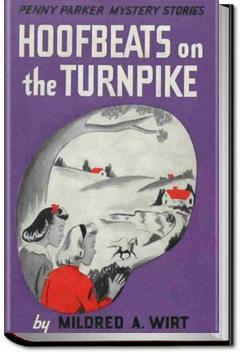 In HOOFBEATS ON THE TURNPIKE, Penny is drawn to a remote hill community by a tantalizing tale of a headless horseman who ranges the countryside at night. While investigating the bizarre tale, Penny and her best friend Louise Siddell encounter a quirky array of hill folk, including a feisty "granny woman" who is at war with a wealthy landowner. The headless horseman seems to be targeting the landowner, who has ignored repeated warnings that the dam he owns is unsafe. The tale takes an unusually serious turn when the dam breaks, flooding the community. Trapped by the flood, Penny heroically does what she can to help the community and to get the story out to the world. Penny was astonished for she had not mentioned her father’s name.